JUST RUN's colorful and fun manual is full of helpful tips to make your program a success! It includes Ideas & Suggestions, Advice, JUST Stretch & Warm Ups, Drills & Relays, and lots of additional activities. It was designed to serve as a supplemental reference and guide to assist leaders in the field. 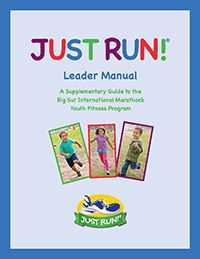 All JUST RUN leaders operating under the jurisdiction of the Big Sur Marathon's program, and actively engaged with a group(s) of children, may request a Leader Manual. After you, as a leader, have entered the names of your kids into the database and would like to receive a copy, please use our contact form to send the following information to our office. The Leader Manual is also available online. All or sections of the manual may be printed as needed. If you are a leader under the direction of the independently operating Licensed Chapter programs in Albany, NY, Miami Lakes, FL, or Lake County, OH, you may request a copy, if available, from your Chapter's program administrator.